It has been said that the current pattern of the Kimono was from the Edo era. The Twelve-layered ceremonial kimono is an item from an older era. And there are differences when comparing this to the current Kimonos. The late Edo era is a peaceful era and it is known that various cultures evolved during this time. 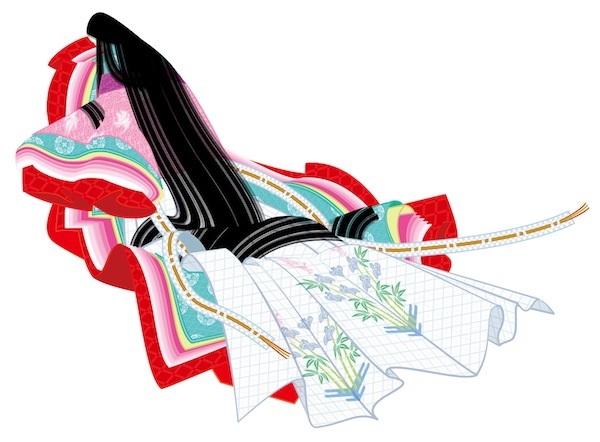 It is believed that the Kimono culture was developed and established during this time. Western clothes were trending during the Meiji era so these were worn during this time. Despite that, Japanese clothing has been a norm for the masses and it can be said that the Kimono culture was born and established during the Edo era. The Taisho Era is the era which is painted in “Haikara san ga tooru” (Here comes ‘Miss Modern’). The kimonos were influenced by the Western style and there were created gorgeous things. The most popular antique kimonos were in general those from this Era. Actually, we are not talking about such old times, as the second half of Showa Era, when the Western style clothing started spreading and the kimonos began to be worn only on special occasions. People thought once that the kimonos were out of fashion, but it was reconsidered as a fashion item, and recently, the number of people wearing kimonos increased.